If you're going to leave out letters on your personalized license plate, your intended message should still be apparent. 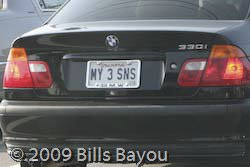 Case in point: "MY 3 SNS" is obviously someone who has three recalcitrant sins. Given the limitations of characters and spaces, they left out the vowel "I" without losing the sound itself. "SNS" is clearly prounounced "sins". Given the car, I'd say the sins were "Pride", "Greed", and "Lust". I'm not sure why they felt the need to brag about it. Perhaps they're proud of them, want them all for themself, and it gives them a warm fuzzy feeling when they commit them. I once made it my New Year's Resolution to commit each of the Seven Deadly Sins: Pride, Envy, Greed, Lust, Wrath, Sloth, and Gluttony. By January 3rd, I was done. It was easier than losing 15 pounds and quitting drinking. For the most part, it also made me easier to get along with than a dieting drunk on the wagon.